CityJet are proud to announce Climb High, our Cadet Pilot training program. 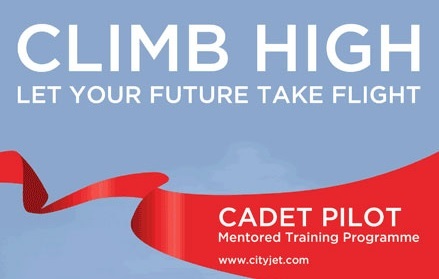 We are currently seeking highly motivated candidates to become cadet pilots in our organisation. CityJet operate throughout Europe with bases in Dublin, London City Airport and Paris CDG. Our fleet consists of 20 Avro RJ85, and 15 Fokker 50 aircraft. Click here to view "From the Flightdeck"
Video "From the Flightdeck" on CityJet's YouTube page, shows footage filmed from the flightdeck of CityJet's Avro RJ85 aircraft, including a steep approach landing at London City Airport with a low visibility approach at Dublin. Enjoy the view from the best seat on the aircraft! Likely to obtain a JAA Class 1 Medical endorsement. Able to fund the full cost of the FTO training course. Fluent in the English language with the potential to qualify at ICAO level 6. School Leaving Certificate with 6 subjects including mathematics, English language and a science subject. 5 GCSEs/SCEs at Grade C or above 3 of the subjects must be Mathematics, English language an Science plus 2 A levels or 3 Highers at Grade C or above. 3. Other Countries:Candidates must demonstrate that they can meet the equivalent of the minimum educational standard required of Irish educated candidates. 4. Exceptions:Candidates who lack these basic minimum qualifications but can demonstrate a higher level of achievement through vocational qualification at a tertiary level can be considered where they can show competency at mathematics and science.